Why change to a Social Enterprise provider? Childcare Vouchers closed to new entrants only in October 2018. This means that while employers can no longer set up a new Childcare Voucher scheme for their employees, they do have the option, if they already offer a scheme, to switch from their current provider to Employers For Childcare, the UK’s only Social Enterprise Childcare Voucher provider. By choosing to use our Childcare Voucher Scheme, you’re choosing to buy social. We reinvest 100% of our profits to fund our charity which provides an advice service for working parents and carries out vital research and policy work. We are proud to be a social enterprise supplier providing a great service whilst at the same time improving the lives of working parents across the UK. Social Enterprises, just like any other businesses, seek to make a profit but it’s what we do with this profit that sets us apart. As a social enterprise, we reinvest our profit to create positive social change. So how do we actually do this? We reinvest 100% of the profit we make from our social enterprise activities in to our charity. The aim of our charity is to support parents with dependent children – making it easier for them to get into and stay in work. Our charity provides tailored information and advice on childcare, family and work-related issues coupled with personalised ‘better-off calculations’ for parents to make sure they are getting all the financial support they need to access and stay in work. This service is free, impartial and confidential. Our clients are proud to work in partnership with us, and they represent all sectors across the UK, including Government, business, charities, universities and other social enterprises – the one thing they have in common is that they want to add social value to their purchasing choices!. 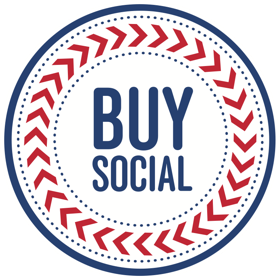 By switching to our Childcare Voucher Scheme, you are choosing to buy social. The switching process is straight-forward and our dedicated business team will guide you through each stage. By switching to the UK’s only Social Enterprise Childcare Voucher provider you can be confident that your organisation is changing the lives of working parents. For every one of your employees registered to use our Childcare Vouchers, our charity can provide 17 advice sessions for parents across the UK. Because you’ve chosen to buy social, not only are you supporting our charity which helps thousands of parents each year, but you’re also supporting your staff who can benefit from this advice service too. Our team of expert advisors can provide free advice and 1-2-1 support for your employees to ensure they are accessing all the financial support they are entitled to. We can also advise employers on maternity/paternity legislation, flexible working and family friendly policies. We are a founding member of the Childcare Voucher Providers Association (CVPA). We adhere to the CVPA Code of Practice set up by the industry body, which guarantees our clients receive the highest quality service and that all funds processed by us are fully safeguarded. All Voucher funds are kept separately from our own capital, and are held in a dedicated ‘client account’ which reassures employers and their employees that their money is always safe with us. Since 2012 we have held the ISO/IEC 27001:2013 Accreditation for Information Security Management. Our information management system is fully compliant with international best practice security processes. This is independently audited annually to ensure a safe and secure exchange of information that protects employers, parents and childcare providers alike. This goes above and beyond the legal requirements under GDPR and shows we take the management of your information seriously. Since 2006 we have held the ISO 9001:2015 Accreditation for Quality Management System. This demonstrates our commitment to managing quality across our business and identifying areas for improvement by maintaining compliance with this international quality standard. This is independently audited annually to ensure we continue to provide the best quality service to all of our clients. From the moment you speak to us you will have a named client account manager to guide you through the simple switching process within a timeline that works for you. In addition, we will provide support you may need to administer the scheme, with minimal time commitment from your own employees. Don’t just take our word for it, 100% of employers using our service would recommend Employers For Childcare to another organisation. Read testimonies from our happy clients at the top of this page! Employers For Childcare’s industry competitive rates are offset against your savings on National Insurance Contributions generated through offering the Childcare Voucher scheme, which means this service is provided at no cost to you. I’d like to buy social, how do I switch? If you’ve chosen to buy social, and support the work of a charity helping parents, get in touch with our Business team – who will guide you through the straight-forward switching process. It’s easy and we do everything for you!